Match Super Angry Kitty and Batman™ against the Micro Manager to recreate the thrilling final battle scene from THE LEGO® MOVIE™. Help Super Angry Kitty attack the Micro Manager and teach him to be more friendly. Soar through the air with Caped Crusader Batman™ and attack with his Batarang and grapnel gun. Evade the Micro Manager’s grabbing claws and flick missiles and watch out for the Skeletron aiming his laser-style shooter from the ground. Jump onto the back of Micro Manager and activate the explode function to finally bring down this marauding menace! 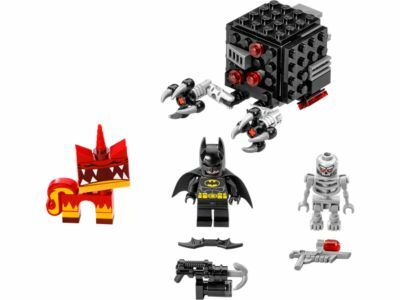 Includes a Batman™ minifigure with weapons, plus 2 figures: Super Angry Kitty and a Skeletron with a weapon. Price is 60% above the initial Lego retail price! This comes down to 20.83 cent per brick. The Batman™ & Super Angry Kitty Attack (70817) Lego set is no longer directly available from the sites below. However, 3rd party partners of these sites might still have the set available. Alternate description Recreate THE LEGO® MOVIE™ Batman™ & Super Angry Kitty Attack on the Micro Manager with flick missiles, grabbing claws and explode function.